Review In A Nutshell: All Your Perfects is a raw, heartbreaking read that deals with heavy topics of infertility and infidelity. 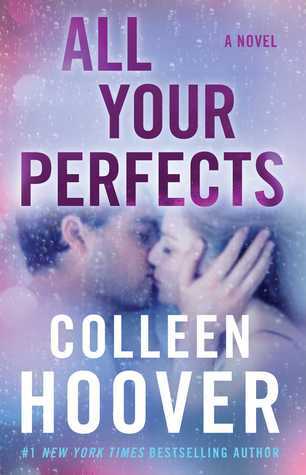 All Your Perfects follows Quinn as she copes with her marriage falling apart. Despite the fact that she loves her husband, Graham, she continues to fall into a depression because she can’t have a child. The chapters alternate between now, as Quinn struggles with her infertility, and then, 7 years earlier, when Graham and Quinn first met and their first year together. This book is definitely the heaviest Colleen Hoover book I’ve read. While previous books of hers have had some comic relief to break the tension, this book doesn’t have much. It is almost solely in the then chapters, and definitely has less of an impact than in her other books. However, like other Colleen Hoover books, it definitely is a fast read that you won’t want to put down. Colleen Hoover’s writing style is great. There are so many beautiful quotes from this novel, but while reading it feels so real and honest. She manages to evoke so much emotion with this book. It is an absolutely brutal read, and your heart will feel like it was run over a million times by the time you finish it. The characters in All Your Perfects were interesting. The book focuses almost entirely on Quinn and Graham, with their families each having a small role as well. They both are interesting characters, with great development and backstory. Their relationship also feels very real. It isn’t romanticized or glorified. This book shows how a marriage requires work in order to thrive, no matter how perfect the couple seems. There are a few points where I did get really frustrated with them because of their avoidant tendencies. If you get easily annoyed by miscommunication and plots driven by characters just refusing to talk to each other, then you may get frustrated too. But it is done purposefully and it makes sense for the characters. I mean, I can’t judge them. I avoid confrontation at all costs as well. This book deals with a lot of heavier topics. Infertility is a major part of the plot. This is a subject I know practically nothing about, and I’m so glad this book shines a light on it. I can tell this book will mean a lot to people who have gone through similar struggles to Quinn’s. Skip to the Pros & Cons if you wish to avoid the trigger warning and spoilers! I really wanted to discuss one other part of the trigger warning, but it will include some spoilers, so only read this part if you are okay with being spoiled. So, cheating is something that, in my opinion, is never okay. In this one case, it didn’t completely ruin the book for me, but it still bothered me a lot. Graham kisses another woman while married to Quinn. He does admit to it, he only blames himself, and he offers an explanation that isn’t an excuse. While I’m still not comfortable with it, I also understand it is something that happens, and something some couples do deal with. I can see why Quinn forgave him, but I still don’t like it. All Your Perfects will crush you emotionally and leave you going back for more. I took a break from Colleen Hoover, but I decided to give her another try and put this on hold from the library. Your review makes me even more excited to read it! I’m so glad! This book was definitely one that stood out to me in comparison to Colleen’s other books.